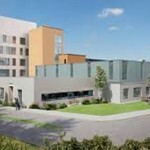 The Critical Care Unit project represents a major investment by the HSE in the Dooradoyle Campus and consists of a six storey block over two levels of basement car parking. The clinical nature of the building required a design that met exacting modern healthcare standards following extensive research into best practice in areas of infection control, sustainability and healthcare planning. BET were engaged on the Emergency Department Mid-Western Regional Hospital as Airtightness Consultants advising the client on the onerous requirements and specification. We were employed as airtightness consultants to carry out site audits of the ongoing works, review of details, complex junctions, and the FINAL ISO 17025 INAB Accredited airtightness test.